Position: Performer, producer, song writer, & publisher. 1970 – Ralph wrote song #1 of the Brotherhood Of Man release. Album: United We Stand. The following news was written in the CDN Monday November 2nd 1970. The concert advertisement ran in the CDN around the same period. No Author name posted. 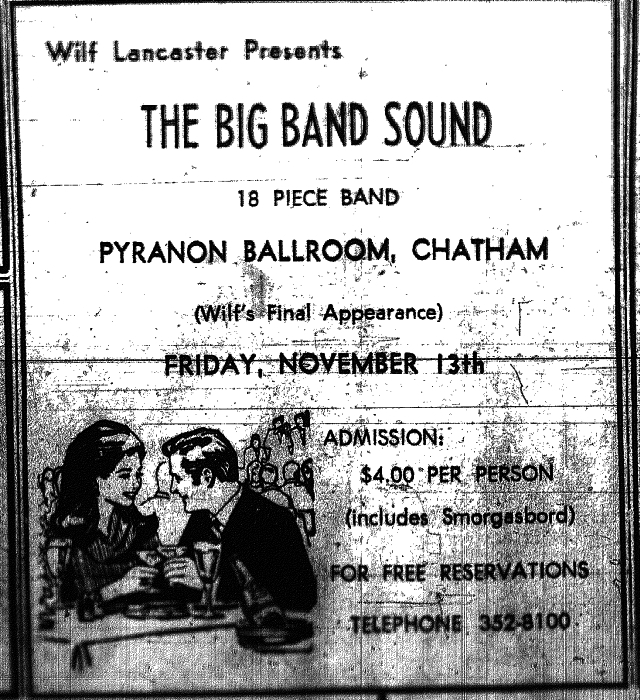 Wilf Lancaster is retiring as leader of Chatham’s best known orchestral group, but the “big band sound” he initiated will linger on. 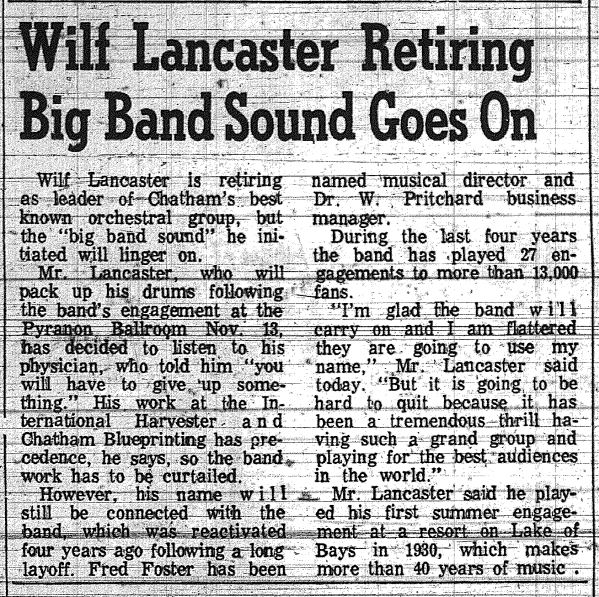 Mr. Lancaster, who will pack up his drums following the band’s engagement at the Pyranon Ballroom Nov. 13th, has decided to listen to his physician, who told him “You will have to give up something”. His work at the International Harvester and Chatham Blueprinting has precedence, he says, so the band work has to be curtailed. However, his name will still be connected with the band, which was reactivated four years ago following a long lay off. Fred Foster has been named musical director and Dr. W. Pritchard business manager. During the last four years the band has played 27 engagements to more than 13,000 fans. “I’m glad the band will carry on and I am flattered they are going to use my name”. Mr. Lancaster said today. “But it is going to be hard to quit because it has been a tremendous thrill having such a grand group and playing for the best audiences in the world”. 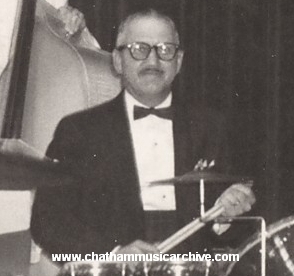 Mr. Lancaster said he played his first summer engagement at a resort on Lake of Bays in 1930, which makes more than 40 years of music. Article: Jan.31st 1970, By Doug Waite, CDN. There’s a musical group in our town, which, if dedication and perseverance is any indication, will eventually make it to the top. 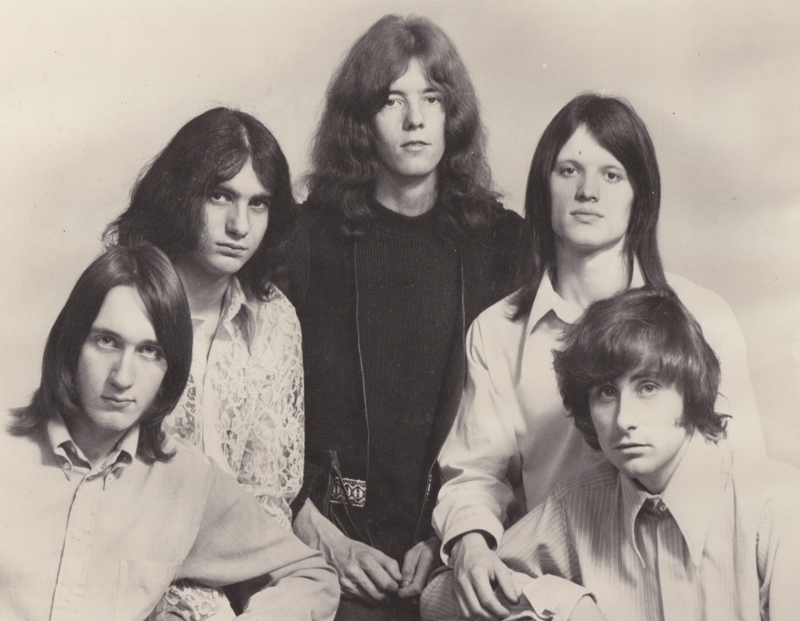 The Quintet comprised of Mark Tremblay – Organ, Byron Stoehr – Bass, Raymond Violot – Vocals, Harmonica, Rick Chrysler – Drums, Tom Lockwood – Gibson Guitar call themselves Nexus. This name of Latin origin means “bond and unity”. And bond and unity is just what these young fellows have displayed in their endeavor to create a sound that will give Nexus an individuality instantly recognized as all their own. They played at the Thames Theatre Laugh-In last Saturday night and judging by the number of people – young people in particular – who crowded into the art gallery to dance and listen to the style they are in the process of perfecting, is “going well”. On January 31 The Nexus are producing their own concert and dance at the Thames Theatre. Three bands will be featured in the production. Besides The Nexus, the New Set will be there from London and another Chatham based group. Refugee will perform in addition to the concert, a dance will be held simultaneously in the art gallery for those who like to dance. According to the members of The Nexus the event will be the best of its kind ever held in the area. The Nexus have an unusual history and many people would like to know why the group took steps to separate themselves from the outside world. In explanation it is interesting to know that the boys, about seven months ago, moved to the wide open spaces near Erieau and secured a big house where they could practice to their heart’s content without complaint from any unsympathetic public. Actually, explained a spokesman for the group, the band had been together about 18 months. Most of that time was marked by doing other people’s songs with other people’s arrangements. The spokesman said the band never had the time to develop anything substantial on their own because of commitments to school, jobs, and inadequate rehearsal facilities. 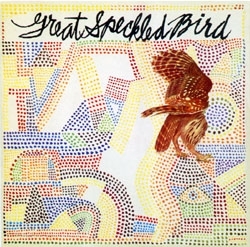 “Finally” he said, “in spite of these obstacles we arrived at a point where we either had to take the necessary steps to develop our own music or settle for another run-of-the-mill rock group”. With this in mind four of the five members of the band severed practically all connections with “normal” school, work and social life in Chatham and moved to the house near Erieau. The other member, who was unable to come because of commitments at home, joins his confreres whenever possible. There, with almost unlimited rehearsal time, they were finally able to concentrate on the music they wanted to produce. This explained the spokesman, involves more time than at first appears. While arrangements are, of course, part of the music the Nexus play, improvisation is the thing. That’s the most important part of their music. Everything is not peaches and cream however, and to play music such as theirs the Nexus must have the perseverance to be able to accept the setbacks and criticisms that are part of the progress pattern. It is to their credit they have been able to go through many changes and still remain original membership. Style: Hits of the time. Notes: A band put together for touring Quebec and Ontario. 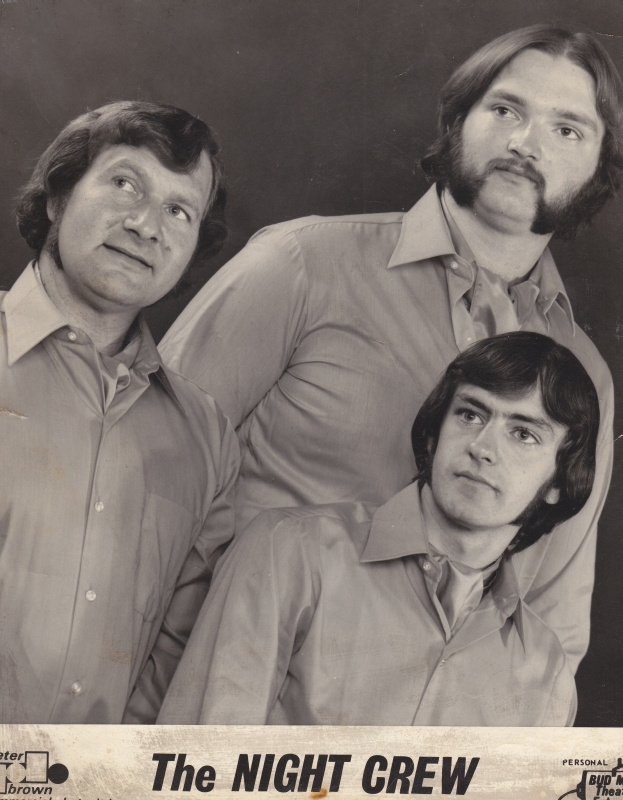 The band was noted for having a 3-piece horn section which was not a common thing. 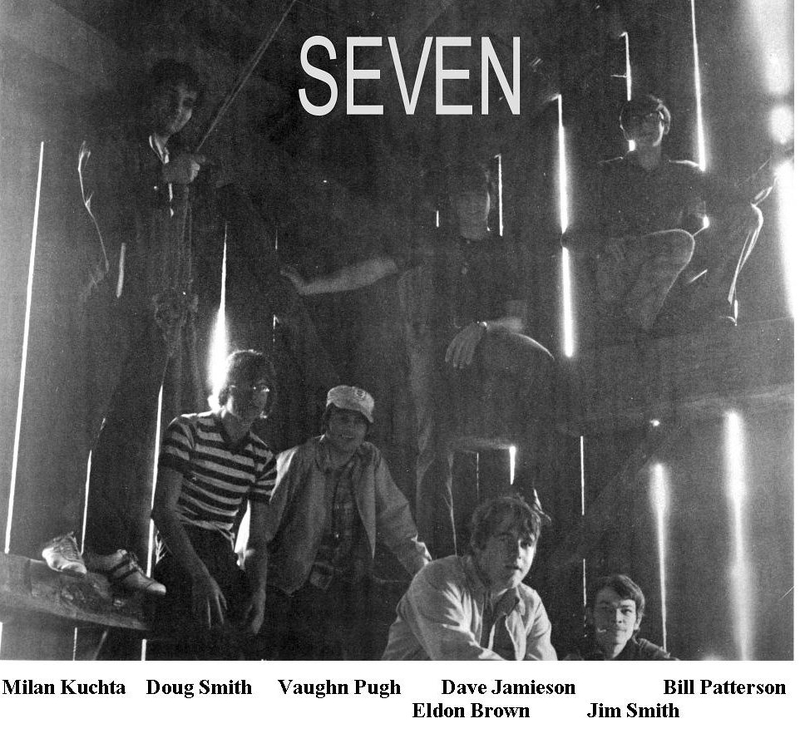 Seven was short lived, but members went on to form ‘Sixth Concession’ and later Niteflite. The band could be heard performing tunes by groups such as Chicago and Blood, Sweat, & Tears. If video does nor appear, watch it here. You are currently browsing the archives for the 1970 Music category.